I am called to be a humble person; To put God at the top of my list. Nothing else should be more important to me than the Lord. Unfortunately, all too often, I find myself trying to do things my own way, veering away from the Lord. I like to think that I have had great ideas, or that somehow I was responsible for the good things that happen in my life (the bad things, I’m often willing to say were God’s doing). Immediately upon reading this part of our verse for today, I am reminded of Psalm 16:18, “Pride goes before destruction, and a haughty spirit before a fall.” I find that pretty much everything that has caused me grief is some how related to my pride. I think of myself instead of others or the Lord. I may even think myself better than others (and dare I say the Lord). Sure I can have those french fries, I’m worth it. Says who? It’s alright if I park in the reserved space, I’m only going to be a couple of minutes. I don’t have time to make the meal for that family. I have to get ready for a party. Whatever it is (and there are so many more examples), they all relate back to pride, or putting myself and my own needs above the needs of others. But I am not left in my pit of prideful despair. The Lord is working on me, He is showing me my faults and like pealing away at an onion, each layer reveals something new I need to work on. Does God do this because I am such a disappointment to Him? No He does it because I am such a disappointment to myself. He points out (sometimes gently, sometimes blatantly) the things I need to work on, because it is in my best interest. He loves me and wants me to live free from all of my pride filled pains. He is a lamp showing my sin so that I don’t have to live with them anymore. Revealing the sickness so that I might be healed. It’s like going to the Dr and finding out you have a cracked rib. You knew you had a lot of pain in your ribs, but you didn’t know what was the source. Dr. God (sorry for the silliness) takes an x-ray of your chest and shows you that you’re indeed broken. Without God showing you your brokenness, you wouldn’t know what to do differently to allow you to heal. We live in a sinful, painful world. I would venture to say that there isn’t one person out there who is reading this that hasn’t known some pain that has lingered on for years. But God can heal you of that pain. He is a lamp that will lighten your darkness. 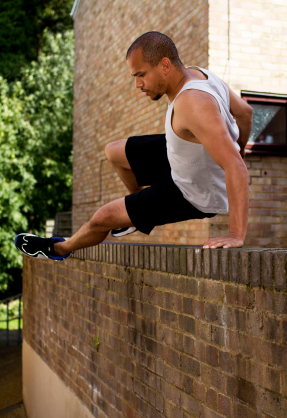 Can you leap over a wall?